Each year I fall in love with autumn anew. The near-miracle of an overnight transformation of leaves into a variegated tapestry of gold and sienna, the mellow scent of bitter chrysanthemums, the melancholy music of rain playing in the fallen foliage… All of these changes in the weather prompt me to change my fragrance wardrobe as well in order to match the new scents in the air. Although some of my favorites continue to dominate my selections—Annick Goutal Neroli, the ethereal orange blossom, is my favorite morning fragrance year round; Frederic Malle Carnal Flower is one of my constant passions — some fragrance make their reappearance this time of the year. Below is my list of current favorites, in no particular order. The earthy darkness of roses in Rose de Nuit is not for everyone. In fact, it is less rose dominated than one might expect based on the name. Wood, moss and animalic notes create the main impression, while roses play a supporting, although important role. Somewhat challenging, but alluring fragrance. The rediscovery of Diptyque through their newest additions has been the main surprise for me this fall. In contrast to the somewhat one-dimensional and roughhewn compositions dominating the line, Eau Duelle is an elegant oriental. Very comforting and soothing on those cold fall mornings when the last thing one wants to do is get out of bed. This Belle Epoque reminiscent composition works best for me in the colder months when its warm facets no longer strike me as overly sweet and rich. Furthermore, the contrast between the luxurious woods of the base and the chilly iris in the heart is simply magical. The peppery roses of Caron Parfum Sacré have done a great deal to influence a whole trend of spicy orientals. Even though the fragrance may seem a bit dated given its large dose of eugenol (clove like aroma material present naturally in clove, allspice, pepper and other spices), I find it enchanting. Above all, like Frédéric Malle Noir Epices, it avoids the heavy sweetness that tends to accompany this genre of fragrances. Pepper and frankincense are a perfect match, because these two notes share a number of common element (in perfumery school we grouped them in the same category.) I love Poivre 23 for its ability to showcase this marriage—luminous, spicy, woody, delicately smoky. A simple, uncluttered composition. I fell in love with Cologne Noire almost immediately upon smelling it at the store and did something I hardly ever do these days—I bought a bottle on the spot! It orchestrates sandalwood, cardamom and incense into an airy construction, much like the carvers of the Taj Mahal manages to make stone appear as delicate as the finest lace. Really quite extraordinary! Maple syrup sweetness contrasted with smoky woods give Mechant Loup a pleasing richness. There is something about it that makes me crave this fragrance whenever I smell the damp, musty scent of fallen leaves. Dark, yet wistful. Sandalwood and patchouli comprise the main elements of Coromandel, a fragrance that I see as an oriental accord of Chanel Coco. A nod to the grand perfumes of the past, but rendered in a thoroughly modern manner. Like Coco, Coromander is a season fragrance for me which I wear in the colder months. Out of all Lauder fragrances, Private Collection stands out for its incredible elegance paired with dramatic impact. After all, it is hard to find another fragrance where galbanum is used with such a free hand (reformulated Balmain Vent Vert and Chanel No 19 no longer have the same effect for me). Its marvelous bitter green note lends the composition depth and complexity. An American classic! To see other Top Ten of Fall lists, please visit: Grain de Musc :: Now Smell This :: Perfume Posse :: Perfume Smellin’ Things. 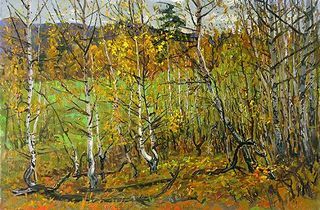 Painting : “October” by Yuri Skachkov. 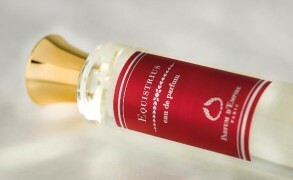 flittersniffer: Since my Eau Duelle epiphany the other day, I have managed to acquire a 5ml decant of it from a Wiki splitter, and declare myself totally smitten. I do believe I could wear this all day and evening for quite some time before I would get tired of it. It reminds me a bit of one of those light versions of Shalimar (the original one, perhaps? ), and a bit of Prada L’Eau Ambree and a bit of Guerlain 180 Ans de Creations, which I wish they had released commercially. Linda: Thank you so so much for this post: I love the painting and can almost sniff the autumnal air by looking at the brush strokes… Also: Estee Lauder Private Collection is a favourite – it is really elegant and retro in the best possible way.  Now to sample Duelle..
BoisdeJasmin: A, I no longer chase after every single new perfume release, only in so far as I need to in order to maintain the blog and be up to date. Cologne Noire is worth sampling. An excellent transparent woody blend. BoisdeJasmin: Carla, your sister has a great taste! I love the idea of a giving a perfume gift. Originally, I was thinking of creating something myself, but frankly, I had no time at all. We had a lot of different things happening at the same time. 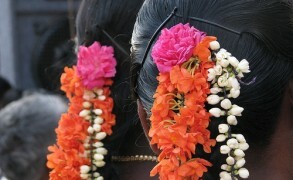 Plus, having a wedding in another part of the world is hectic enough!